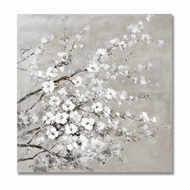 The Cherry Blossom Painting is a beautiful piece of artwork, with soft tones of white, gold, pink and taupe. Making it a statement wall piece. The contemporary, neutral colours throughout the design gives a subtle modern feel, while the raised paint gives a rustic vibe.